Waiting for the bride – very excited as Sue and I would meet in person for the first time when she walked up the aisle to Graham! Is it possible to arrange a wedding ceremony just with the bride to be – who lives too far away to meet in person, until she walks up the aisle to meet her husband ? The answer is a resounding Yes! 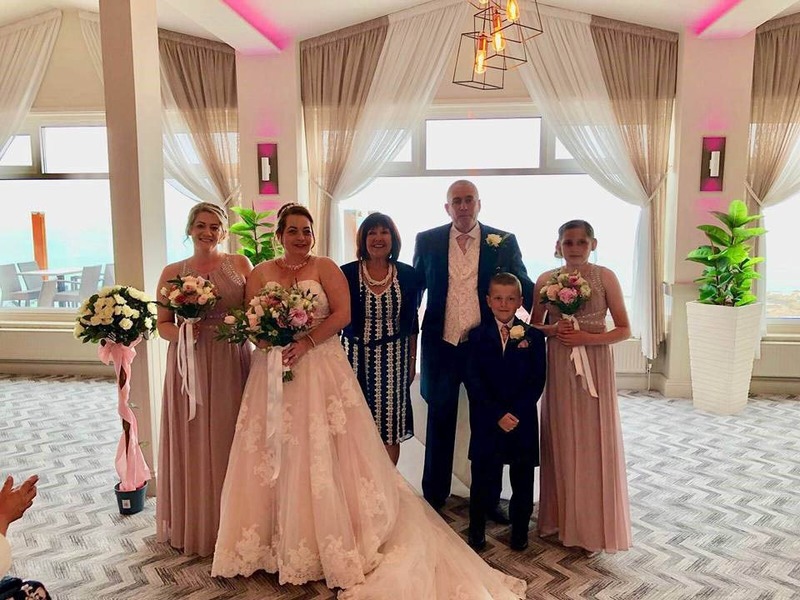 As I did exactly this for Sue and Graham’s beautiful and intimate wedding ceremony, in Westward Ho! in May. Together Sue and I planned the perfect wedding ceremony for her. 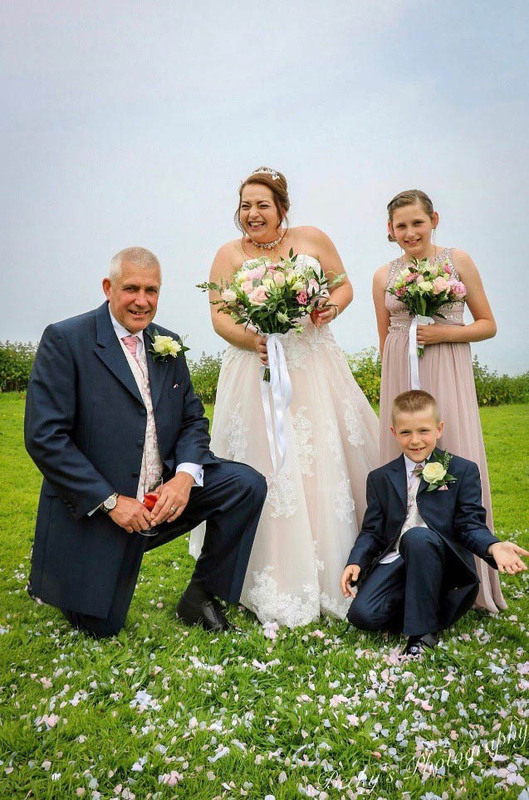 One that expressed her huge love for Graham and their children, one that surprised, touched and moved Graham, and delighted their friends and family. The first email I received from Sue, as we started to plan her wedding ceremony, mentioned just addressing everything to her, as Graham would certainly turn into a ‘Bridezilla’, if he had the chance, and that being ‘Bridezilla’, was her prerogative. 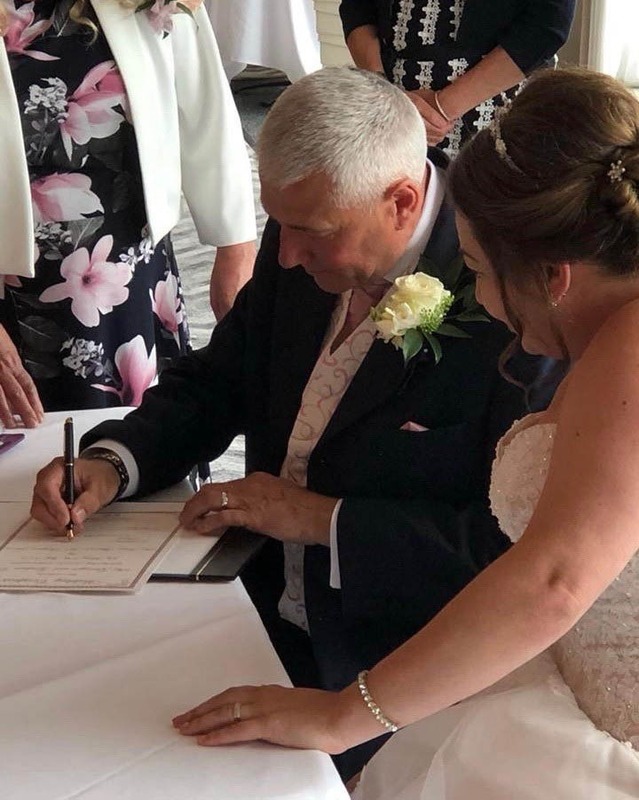 What I quickly got to understand was that this wedding ceremony was a beautiful expression of Sue’s love for Graham and a big thank you to him for being a loving husband and an amazing father to their two wonderful children. Behind Sue and Graham the spectacular Atlantic Ocean stretches far out into the distant horizon. It’s easy to see why Westward Ho! Is their most favourite and special place. 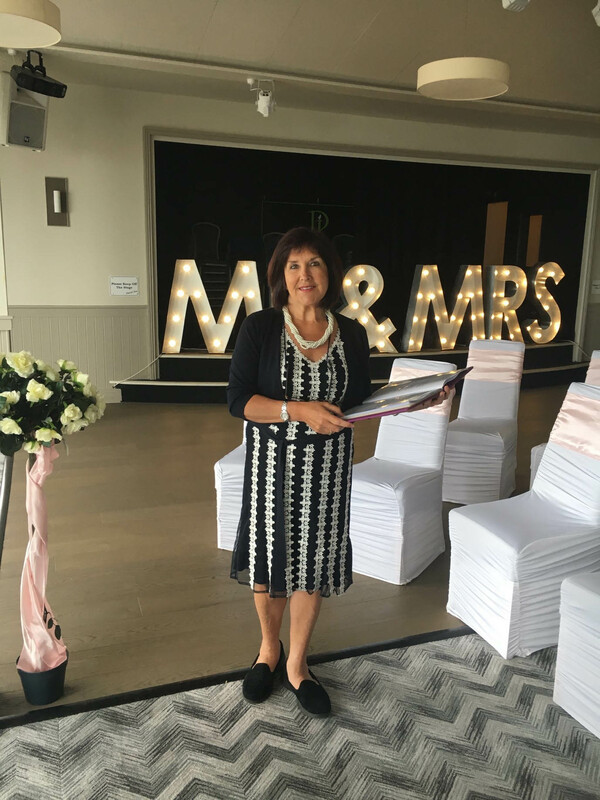 I received an enquiry from Sue, asking me to be her wedding celebrant at her Westward Ho! Wedding the following year. She was really bubbly, friendly, full of wonderful ideas for her ceremony and we connected instantly. The Pier House, Westward Ho! is a very special place for Sue and her family, and I was excited to be part of their day, and, at such an amazing location. Due to the distance between us, we were unable to meet up, and all our communication was via emails, WhatsApp and the occasional phone call. Sue wanted the whole wedding ceremony to be a complete surprise for Graham, so we didn’t even have a run through of the ceremony the day before the wedding. The first time I met Sue in person was when she walked up the aisle to meet Graham, as his beautiful bride. What Sue and I did have, however, was a strong connection with one another. We were on the same page right from the start and we remained there throughout the whole of the planning process. 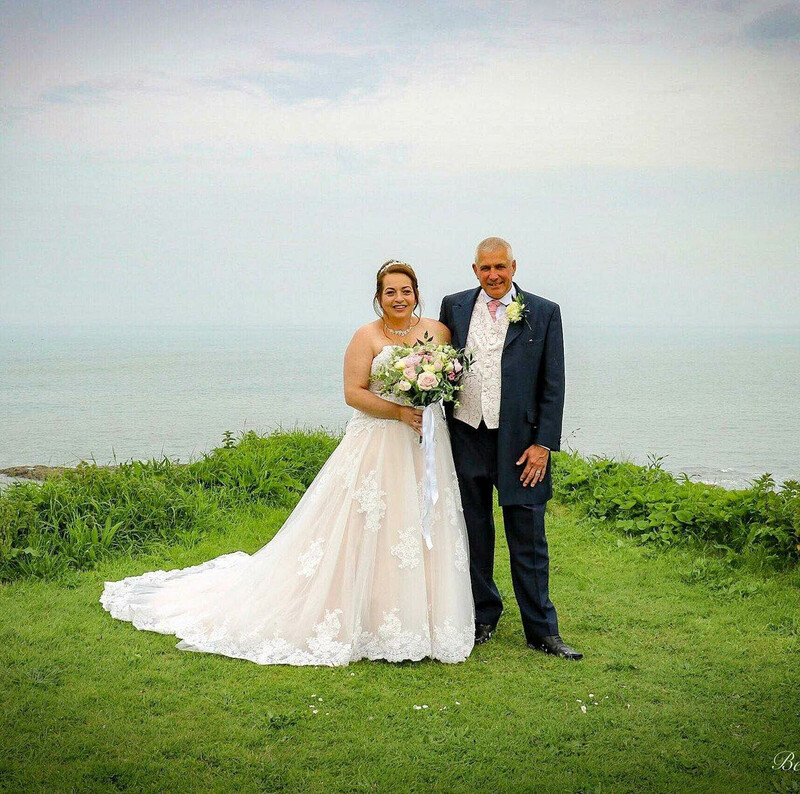 We shared a trust and confidence in each other which was clearly reflected in her wedding ceremony. Was Graham surprised ? Yes, very! Sue told me that he loved every minute of it. By the time Sue walked up the aisle, we had developed a strong friendship and relationship that neither of us wants to let go of, in the future. We will always keep in touch ! Thanks to Becky for the Two Becky’s Photography images.